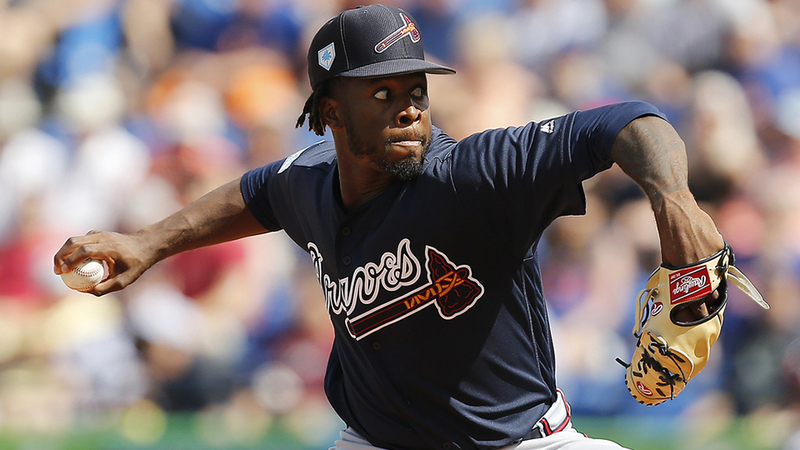 The Braves plethora of pitching options and an ill-timed Grapefruit League appearance conspired against Touki Toussaint breaking camp with the club. One day after he surrendered six earned runs and six hits in 1 2/3 innings against the Mets, manager Brian Snitker told Atlanta's No. 6 prospect he was being assigned to Triple-A Gwinnett to begin the season. The outing pushed Toussaint's spring ERA to 8.62 despite a 20-to-3 strikeout-to-walk ratio in 15 2/3 innings. Following an uneven 2017, MLB.com's No. 50 overall prospect reached the Majors last year after going 9-6 with a career-best 2.38 ERA and a 1.13 WHIP between Double-A Mississippi and Triple-A Gwinnett. He limited opponents to a .202 average and struck out 163 over 24 starts spanning 136 1/3 innings in a breakout season for the right-hander. The 22-year-old won his big league debut against the Marlins last Aug. 13 when he surrendered a run on two hits over six innings. After being sent down to Gwinnett following his debut, he returned to Atlanta in September and finished 2-1 with a 4.03 ERA in seven appearances, including five starts. Despite the reassignment, Toussaint figures to be among the first Braves hurlers who will get a return call to the Majors when the need arises. Adam Duvall and Dan Winkler also were sent to Minor League camp.